During Christmas Day, my family and I wanted to do something a bit unusual – dine out. 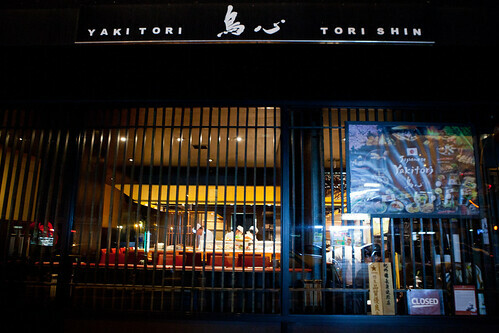 Craving Japanese fare, I figured we should go to Tori Shin, the only yakatori that is Michelin-starred (it earned a 1* since 2012) located in the Upper East Side of Manhattan. 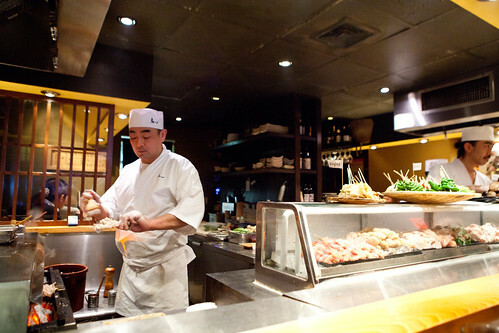 This small, minimalist restaurant is centered around a large U-shaped, blonde wooden counter table that essentially has charcoal grills working on two sides, the center has the yakatori cold case and the back center is a prep area. There were three two tops that essentially are along a black leather banquette and a few tables toward the front of the restaurant. Chefs and waitstaff shout greetings whenever a party gets seated. 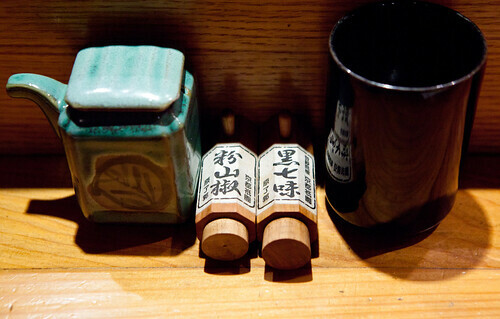 The restaurant’s interior reflects the style of cooking of this temple of chicken. Seasonings are minimalist and but it highlights the chicken beautifully. I should note, all of the grilled chicken served here are cooked to a medium-rare – and yes, it’s safe to eat. 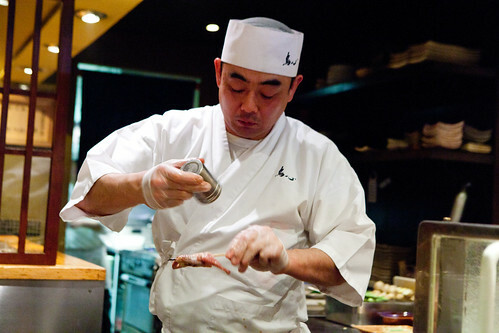 We opted to go a la carte as we wanted to sample a little bit of everything on the menu, rather than the $50 omakase. My family reserved counter seating at one of the corners of the bar, where all the action is. 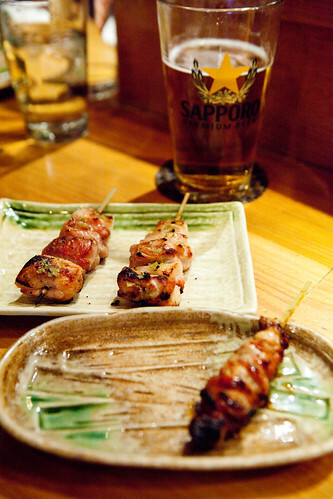 We started with tall glasses of light Sapporo beer ($6 each), skewers of tenderloin with wasabi ($4), chicken thighs with yuzukosho ($5) and chicken rib ($5). 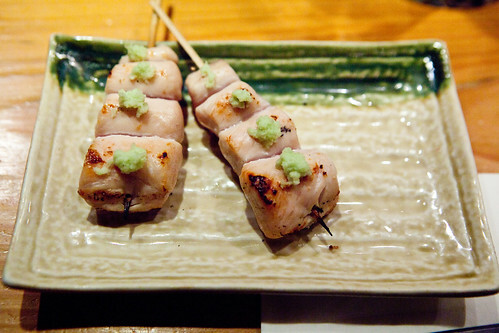 The tenderloin was succulent and the freshly grated wasabi root was zingy and refreshing. The thighs with yuzukosho was juicy and wonderfully spiced and the chicken rib was had good flavor from the bone and a little crunchy from the cartilage. 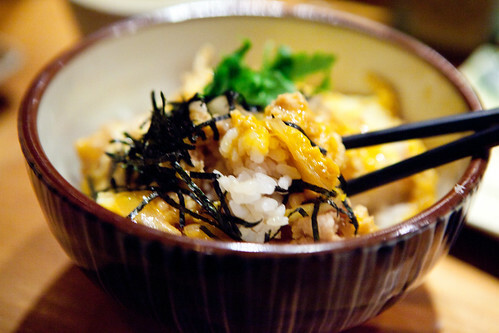 My mom looked forward to the okayo don ($10) the most, as this is a version of comfort food for her. 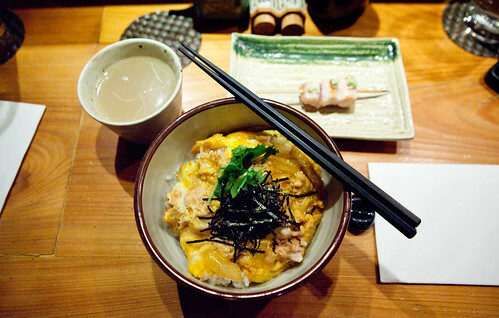 This medium-sized bowl of perfectly cooked rice was simply topped with ground chicken, scrambled egg flavored with sake, and shredded seaweed and a cup of delicious chicken broth. My mom was dreaming of this bowl of rice ever since. 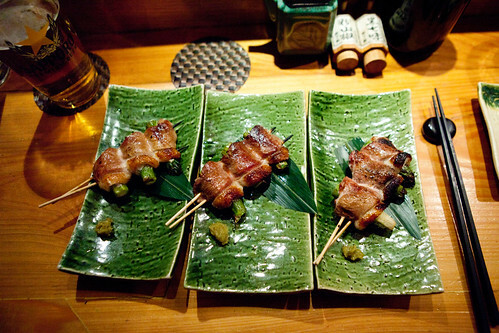 We proceeded with the duck with asparagus ($9 each) that yielded to moist, meaty and smoky duck with thin slightly crisp asparagus stems. 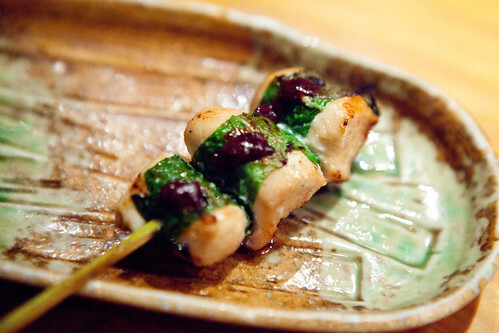 I adored the chicken breast meat with plum and shiso ($4) as it was incredibly moist and the shiso added a hint of freshness the starts at the finishing flavor. 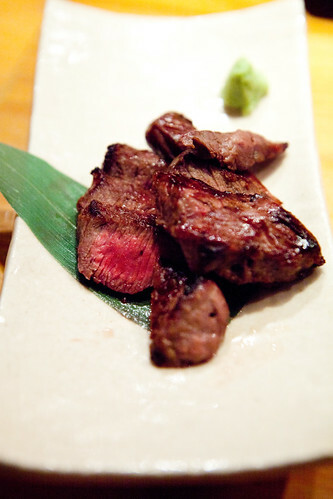 The most disappointing was the Kuroge Wagyu beef with fresh wasabi soy sauce ($18), it’s an Australian beef but lacks the mouth-melting texture one would expect from a Wagyu (and it’s the most expensive a la carte dish). 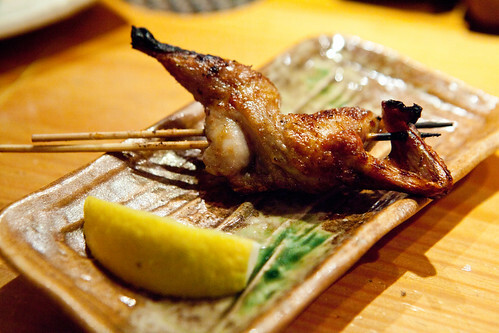 The quail meat ($7) was a delicious halved, boned dark meat bird. 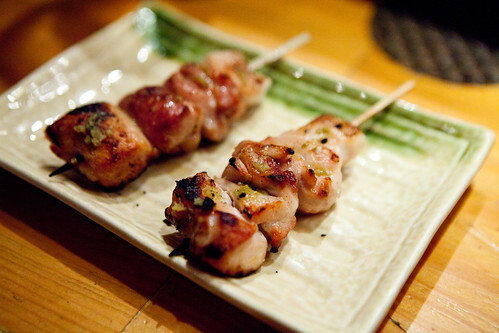 Smoky, well-seasoned, juicy and the a squeeze of lemon brightens up the flavors wonderfully. 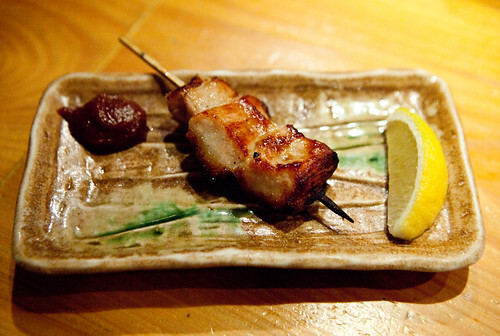 The pork belly with garlic miso was easily liked by the family. It’s tender, not too fatty and the salty, subtly garlic-y miso worked well. We finished off with chicken meatballs ($4) and special kitchen meatball with fresh egg yolk sauce ($7), as their meatballs tend to be their best sellers, as I was told. It does live up to the hype. 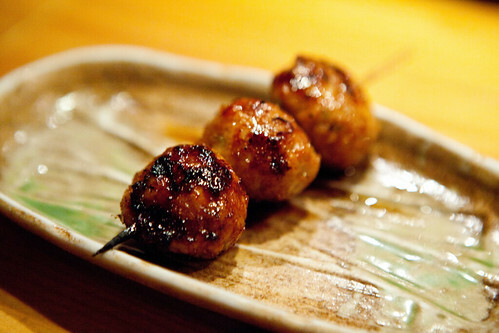 These aren’t your standard chicken meatballs, as it has an incredible depth of chicken flavor, subtle cartilage crunch, and the sweet-savory sauce that the chef dips these skewers toward the last minute of cooking made it delectable. 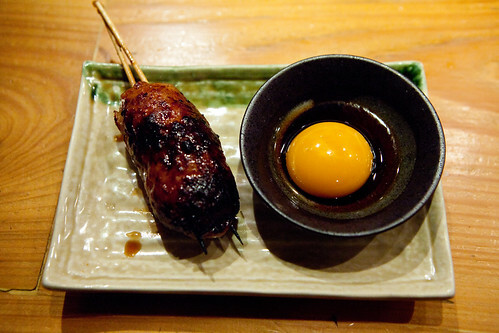 The log-shaped meatball with fresh egg yolk was very similar to the meatball except it’s not as flavorful solo. When you dip the bright orange-yellow egg yolk is mixed with the sweet soy sauce and dip that meatball, it creates a thick sauce that’s sort of sweet from the egg and a hint of salt from the soy sauce. 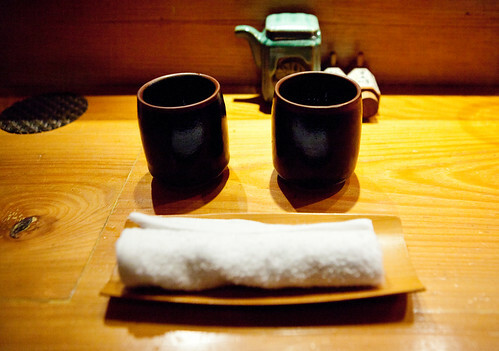 When we wrapped up the meal, we’re given hot towels to wipe our sticky hands (from holding the skewers) and cups of warm, toasty flavored, hojicha tea. 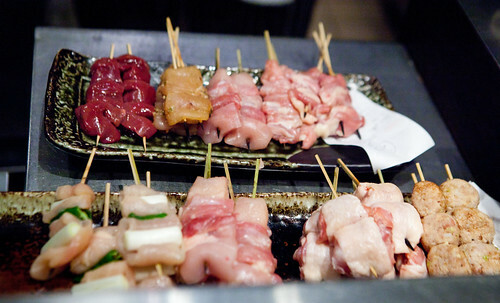 This is a very good restaurant for thoughtfully grilled food in a casual setting. It’s suitable for vegetarians as there is a page in the menu devoted to a small list of vegetables, in case you have to keep in mind for them.